Gorgeous doesn’t even begin to describe this luxe romantic Austin wedding by the incredible team at Pearl Events Austin! 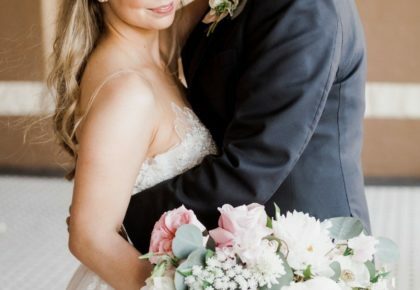 Kate and Cameron danced the night away amidst a whimsical canvas of garden roses and peonies in white, cream and blush pink from Bouquets of Austin. The ballroom was filled with pops of gold from the gilded cake tiers to the votive candles, and endless flowers with romantic lighting and rentals from Premiere Events. 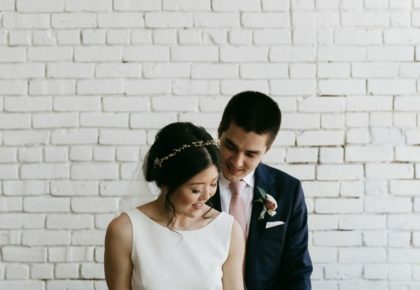 Kate was a vision in a gorgeous ball gown with hair and makeup by Hey Lovely Makeup. Thanks to Sarah Goss Photography for capturing every glam detail. Cheers! Loved ones cheered as they promenaded in through the stunning arch of celestial roses and peonies. The lights shining up through the floral arch made it look as if it was glowing just as brightly as the bride and groom themselves. Kate and Cameron were finally husband and wife ready to celebrate with those closest to them in the city that brought them together. Kate and Cameron met in 2010 during their sophomore year at the University of Texas. They had a class together, and Cameron finally got the nerve to ask Kate for a study date before a looming exam. “I think I made her laugh enough to get a second date, and a few months later we started officially dating,” Cameron says. The two clicked and shared countless college memories together and continued dating after graduation. They dated a little over five years, and then Cameron started to plan quite the event at which he’d ask Kate to marry him. It was January 2016 when Cameron asked Kate’s father for his blessing. Then, Cameron started arranging a party at Hamilton Pool in Austin. “I drove from Dallas to Hamilton Pool to see it for myself, and it was perfect. [It was] not as busy in the winter time, secluded, and just beautiful,” Cameron says. “I was starting to wonder,” Kate says about getting engaged. She started to get a little suspicious when her friend and sister lured her to Austin for a girls’ weekend. Cameron was anxious having been out of town all week, but he knew Kate was in Austin and had no idea he’d soon be joining her. Hamilton Pool was serene, and the 50-foot waterfall was breathtaking. Cameron arrived early in the morning with a crew of close friends and relatives to hike through the park to the pool. Not everything was perfectly smooth, however. The security guard was thrown off that Cameron and his group were waiting at the front gate before the park opened and thought they were trespassing! Fortunately, Cameron was able to explain their early arrival to set up his proposal scene. “On a normal day I would’ve thought the whole ordeal was hilarious, but on this morning it just made me realize how nervous I was,” he remembers. Once everyone hiked the trail to the grotto at Hamilton Pool, they found hiding places while Cameron waited for Kate to arrive. About a half hour later, Kate traipsed through the historic beauty with her friend and sister. She was shocked to see Cameron waiting there by the water. That was when he asked her to spend the rest of her life with him. Kate was thrilled and responded with a heartfelt “yes” through a huge smile. The couple celebrated with about 40 additional family members and friends (another surprise) over dinner that night. Kate and Cameron jumped right into wedding planning. They knew they wanted to get married in Austin where they met. Kate was raised Catholic and knew the historic Saint Mary Cathedral in downtown Austin was the perfect place for the ceremony. For the reception, the couple wanted something grand yet charming. 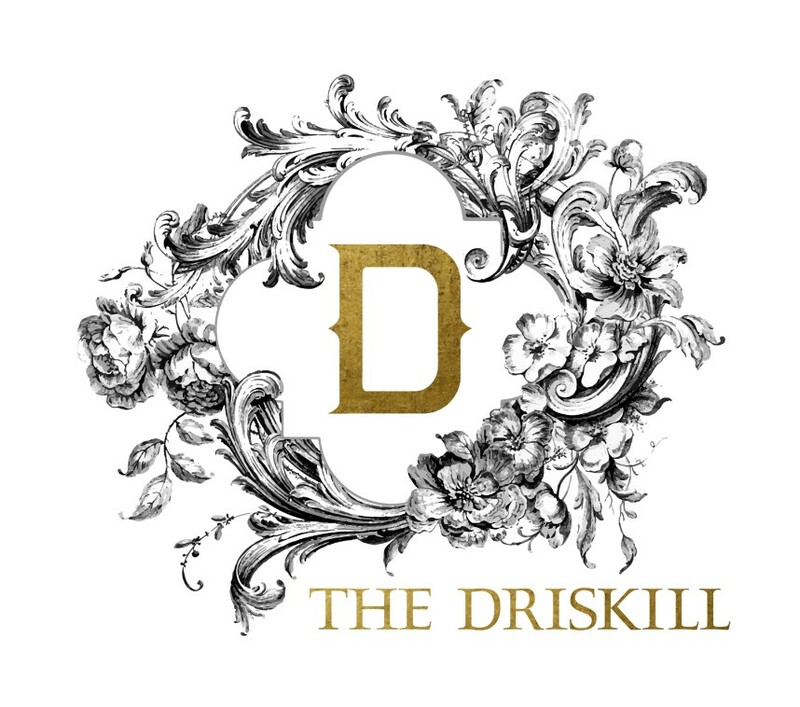 “We loved how ‘Texas’ The Driskill Hotel was. It was elegant and close to Saint Mary’s,” Kate says. 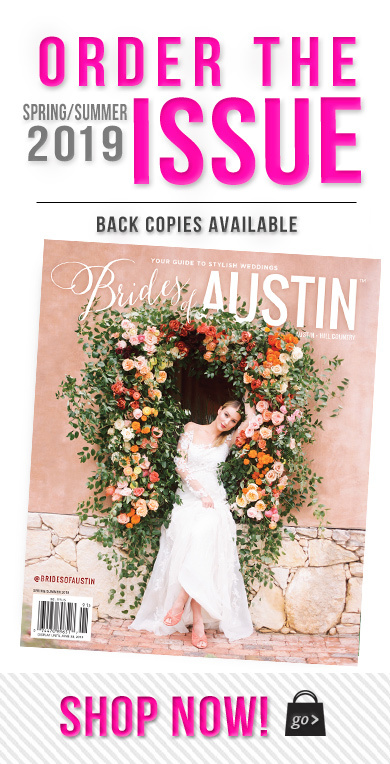 With a 15-month engagement, the couple had plenty of time to work with Pearl Events Austin and their other vendors to design their dream wedding. After the July 4th holiday in 2017 loved ones traveled to Austin for another round of fireworks as the wedding festivities began. The wedding party was greeted with a warm Texas welcome at the rehearsal dinner at the Headliners Club inside Chase Tower with its beautiful views of downtown Austin. With the lights twinkling through the panoramic windows of the 21st floor, loved ones toasted the bride and groom and shared stories and laughs well into the night. On the morning of the wedding, both sides of the wedding party were up early and getting ready for the 2 p.m. ceremony. Cameron and his groomsmen put on their tuxedos, ate lunch and took pictures at the Driskill. Kate, her bridesmaids, and the mothers got their hair and makeup done together in a suite. Kate had bought her bridesmaids matching pajamas, and they enjoyed spending the morning sipping coffee, savoring breakfast tacos, and taking turns in the makeup chair. Once inside the massive wooden doors of Saint Mary Cathedral, just under 200 friends and family members took their seats under the majestic blue dome splashed with stars. The priest was a family friend who traveled from New Orleans, and several friends read from scripture in the hour-long traditional Catholic ceremony. The couple opted not to do a first look, so when Kate made her grand entrance wearing her gorgeous Lazaro ball gown, it was magical. “I will always remember the feeling I had when I finally saw Kate for the first time that day. It was truly a perfect moment,” Cameron remembers. “My heart was instantaneously at peace once Cameron’s hands were in mine,” Kate says. The couple exchanged rings and traditional vows before they were pronounced husband and wife, and Cameron could kiss his stunning bride. While guests made their way to cocktail hour at The Driskill, Kate and Cameron shared appetizers in their room and soaked in the moment. “The party could begin!” Kate remembers. The Driskill was a whimsical canvas of garden roses and peonies in white, cream and blush pink. The ballroom was filled with pops of gold from the gilded cake tiers to the votive candles, and endless flowers with romantic lighting to illuminate their beauty. “I felt like the most special person being surrounded by such beautiful flowers on my wedding day,” Kate remembers. 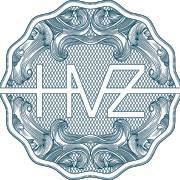 The band announced “Mr. and Mrs. Cameron Sando” as the couple clasped hands in the air for their big entrance to the reception. “It was like a concert. We were high-fiving everybody on the way to the dance floor,” Kate remembers. 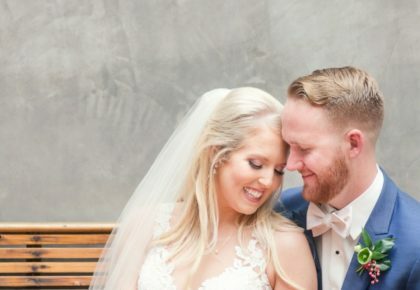 The couple shared their first dance as husband and wife to “Can’t Take My Eyes Off You” by Frankie Valli. The reception was full of dancing, cocktails, sentimental speeches and a delicious crispy chicken plated dinner. The bride and groom snuck out for sunset pictures on 6th Street, but were able to spend most the afternoon and evening mingling with the guests who had witnessed their special day. The newlyweds wanted the end of the celebration to be intimate with a last dance as their guests went outside to see them off. In an empty ballroom so exquisite with its ethereal floral décor, Kate and Cameron danced to “Don’t Want to Miss a Thing” by Aerosmith. “That moment was really special, and I just remember looking forward to this life that we now have,” Cameron says. It was just the way they were meant to begin that new life together in the city where their love story began.